raspberry cranberry pecan conserve. for thanksgiving. I hoped to have a party tonight, just as you asked in your nice PR pitch. You sent me coupons and recipes and a cookbook from Rick Rodgers and asked me to invite people over to join your virtual party. I’m trying not to take it personally, but everyone I asked was busy. No one could come to this festive gathering. So I’m going to be partying all by myself. It’s a very sad version of a Pity Party. I was so sad, I tried the Holiday Berry Bellini recipe you sent. In fact, I may have tried several of them. Really good, so I’ll definitely make myself a couple of those tonight to get in the mood. But I might be wearing my pajamas, so there won’t be any pictures uploaded. Sorry. and berries in a cocktail shaker. Top with ice and shake vigorously. 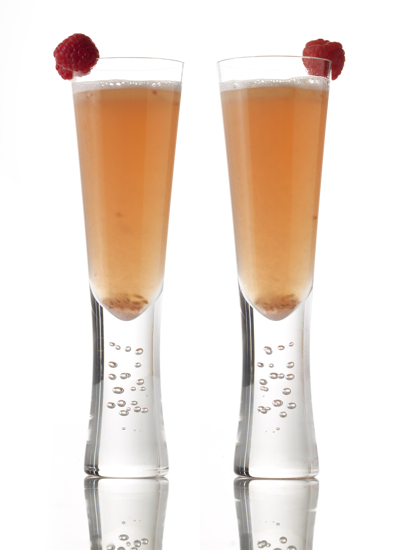 Add 3 ounces sparkling Brut in a champagne coupe. Strain shaken contents into champagne coupe. Garnish with raspberry & blackberry. But I just couldn’t make myself cook all those other recipes for just me. I want to fit into that cute new outfit for Thanksgiving. There was no question in my mind – I would eat the entire eggnog panna cotta with balsamic raspberries. And the warm brie with honeyed raspberries and almonds? I’ll make that, but not just for me. Too dangerous. 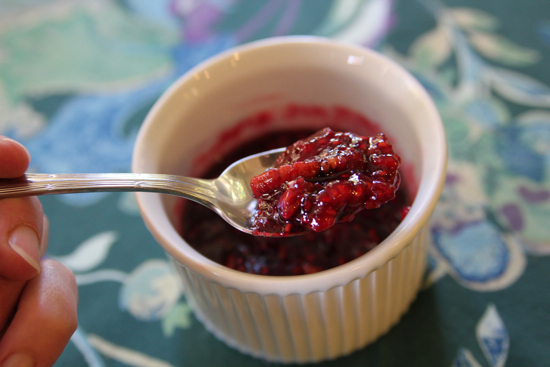 So, instead, I created a tasty conserve that easily takes the place of cranberry sauce on the Thanksgiving table. 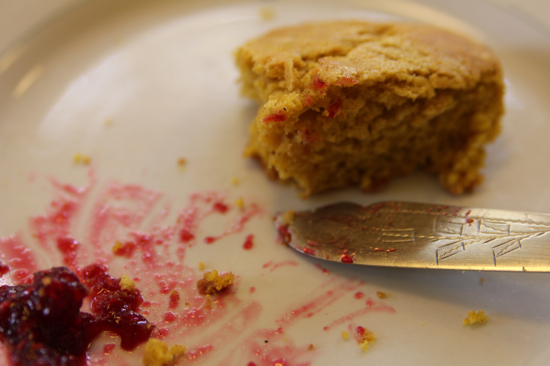 It was also amazing spread on my favorite Butternut Squash Scones – a divine recipe from Food52, by the Pound Ridge Scone Lady, Liz Larkin. So, please forgive me, dear Driscoll. And maybe next year, you’ll decide to include my recipe on your site? 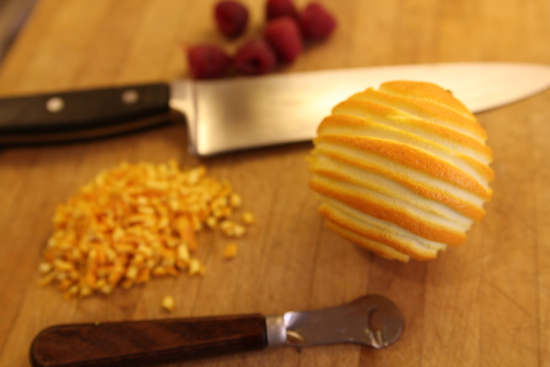 In a heavy 5 quart pot or a preserving pan, bring the raspberries, cranberries, sugar, orange zest and lemon juice to a boil. Place this mixture in a ceramic or glass bowl, cover with parchment, and allow it to macerate overnight. The next day, strain the mixture into the preserving pan and bring up to 220°, stirring all the while. Add back the fruit and then add the toasted nuts. Stir well and bring to a rolling boil that cannot be stirred down. Pack in half pint jars and process in a boiling water bath for 15 minutes. Please wish all the best to the folks partying tonight at #DriscollsMoments get togethers. You’re so hilarious Cathy. Party or no party, this is a GREAT post! Who cares about the book, I’m coming over for those bellinis! This is a hilarious post, Cathy. Very funny post, lovely photos and your conserve recipe looks terrific. Party on (even if you’re on your own), Mrs Wheelbarrow! Poor Cathy. I would come to your party if I lived closer. Then again, I am having a party too and not sure if anyone is going to show. I may be in my PJ’s as well. Raspberries!!! Dear Driscolls, do you mind if I pretend it’s July and I’m standing out in the fields at West Union Gardens u-picking, well, in truth, mostly u-sampling? Thanks for a time-travelling party back to summer! I want a bellini and PJ party! Don’t worry, Driscoll’s. I’ll be buying some of your berries to make the recipe. I love your conserve recipe – and I have been meaning to try Liz’s scones ever since she posted them – a great combo, Cathy. Elyse! You’ve won the cookbook! Please send me your mailing address so I can get it out to you. 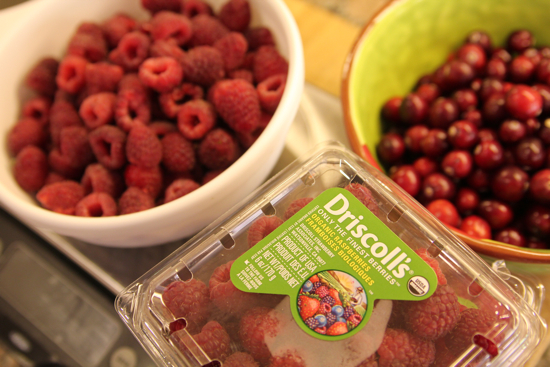 Driscoll’s, right here in Ventura County! Acres and acres of raspberry rowcovers and acres and acres of strawberry fields, nearly year-round fruit production. Warehouse party in Oxnard anyone? 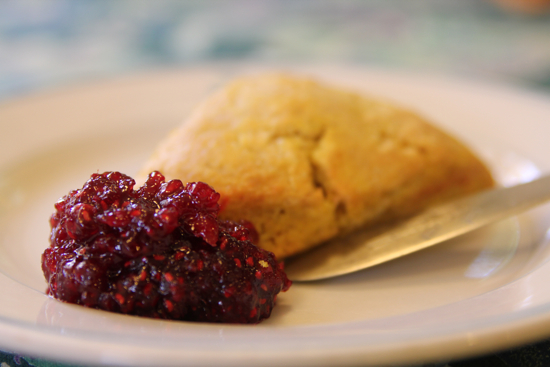 I couldn’t stop laughing…and I’m definitely trying the conserve and the scones! I can’t believe that it is as good as Chocolate Rasberry Whatever though…. Your Raspberry Cranberry Pecan Conserve sounds like the perfect thing to take to hosts of holiday parties – so much more interesting than the usual bottle of wine! I would come if I lived close to DC, even if it was just for the scones! Great post! Just when I thought I was finished with canning for the season, I’m afraid I’ll have to go buy some small jars (ran out of them making chocolate raspberry whatever sauce) and give the conserve a try. Raspberries are the aphrodisiac of the fruit world. I thhuogt finding this would be so arduous but it’s a breeze! spiced sugared pecans, hostessing, gifting and signed books!